and an AGV "46" full-face (several colors, including that yellow) for "now-and-then". I like the Bell enough that I bought an identical one in Phoenix for down S.
Last edited by fasteddiecopeman; 04-06-2017 at 02:06 PM. Recently purchased a Shoei Qwest and have ridden approx. 900 mi. wearing it. Fits my head shape well and is quieter than the Shoei RF1000 that it replaced. I can't comment on the venting due to the fact that it is not yet hot enough to open the vents. Bell is another choice for your head shape and IMO a better value, especially now Aria has moved to more neutral head shapes and away from the LO Profile. i have a Shoei Gt Air (very quiet) and a HJC Fg-15. Bell makes a cold weather kit (~$50) (contains dual pane visor, breath box and balaclava) for snowmobiling for their helmets and I suspect other manufacturers do too. My dual pane visor is fantastic in the cold and wet. It is truly impossible to fog. Only issue is the visor is heavier than the single pane one, so the slightest bump will cause it to come down when it is raised up. Don't bother with the breath box that comes with it as I don't ride in -20C. I've never used a pinlock or fog city visor insert but if they work anything like this they would be a must have for cold weather running. Never had much success with anti fog coatings. Plexus is the best visor cleaner/polish I've found though. A single can is expensive but goes a long way. Don't use glass cleaner, Rainx, or anything like these that contain ammonia or alcohol on a plastic visor though as it will destroy it, particularly with repeated use. Last edited by twowheels; 04-07-2017 at 11:06 AM. I've used Pinlocks for the last maybe 8 years or so -- works great for me, although they only last 1-2 years before they stop absorbing moisture, depending upon how much cold and rain you ride in. And they ain't cheap. I agree on the coatings; I tried many before discovering Pinlock, and none worked very well for me. I tried a Scorpion helmet with a (non-DOT) snowmobile dual-pane visor, which is hands-down the very best anti-fogging/anti-icing solution I've used, but the helmet just didn't fit my L-O head well enough. I use a Pinlock, and it's a must-have for me. Works great. Loving my RF1200 with Transitions shield. I had to sell a few organs to pay for it, but that's the cost of luxury. I've worn Arai for the past 25 or so years. Current street helmet is an XD4. Since I'm no longer crouched over a sportbike on the street, I like the visor to keep the sun out of my eyes. On the track it's a Corsair. If you are in the PA area, or attending a show where they are a vendor, The Service Pavilion is an Arai dealer that will custom fit you for no extra charge. They also have an online option for measuring. This way, I no longer have to spend additional money swapping cheek and crown pads. They'll also build a custom liner if none of the standard options fit. No, I am not affiliated with them in any way, just a satisfied customer for many years. The most important thing is that the helmet fits correctly. It's been my experience that most riders and dealerships don't know how to properly fit a helmet. I have a GT-Air. It's okay. I got a great deal on it a couple of years ago at the Prudential motorcycle show. About the only thing I like about it is the drop down visor. Something I have to stress, is make sure the helmet fits your head shape. Put it on and keep it on for a while, so you can feel if any hot spots show up. 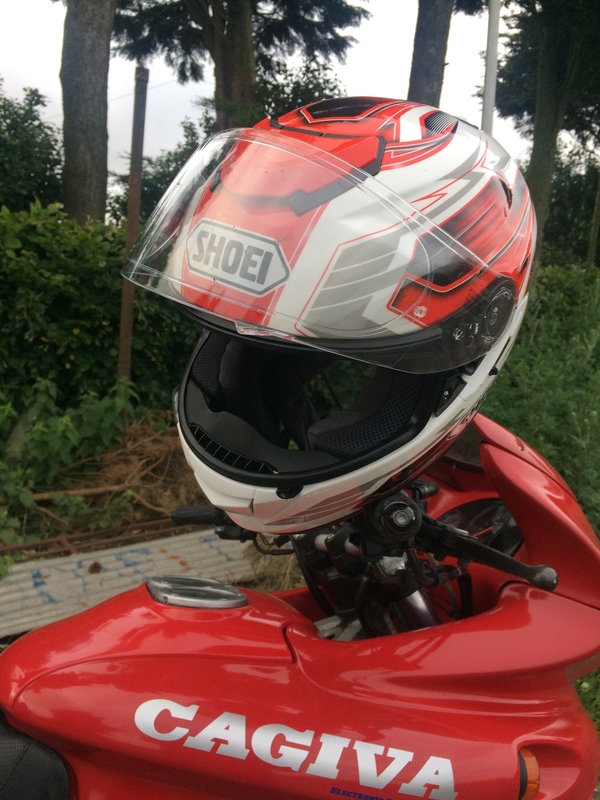 Personally, I've been using a Shoei rf 1100 for quite a while. Fits my dome perfectly, so it's quite comfortable. Found it a bit noisy so I ended up adding a Windblocker to it, which does a great job by blocking the air stream that was going along my jaw hinges straight to my ears. Problem, is that my visor now fogs up like a mother. Nothing's ever perfect uh. I own a Shoei RF1100 and an Icon Salient Airmada. Both are great helmets for me. Recently purchased a Shoei Air GT but I think I will send it back. The fit isn't right for my noggin'. I have a 4 to 5 year old N104, and am due to replace it soon. The only thing stopping me is the reports that the Nolan Bluetooth isn't very good, especially for interacting with other brands. How do you find the B4? Would you buy another one? I'm on my 2nd B4 system, will probably down the track buy the upgraded N104 helmet as well. Last edited by sedro tom; 05-24-2017 at 06:17 PM. Just picked up a Scorpion t1200, to replace my 6-year old EXO500. Fit and finish seem nice, easy to install the SENA on it. I have glasses, but they don't seem too hard to fit - there is a built-in 'pathway' for the the earpieces to slide through. It also has a built in dropdown visor. It's not a very dark visor, but on my EXO500, I put some electrical tape on the bottom of the visor, drop it down about an inch, and used it more like a solid sun blocker. It works really well for cutting through the morning sun (I have an east-bound morning commute) and the evening sun. If it's like the EXO500, I expect almost zero fogging. Of course, living in a low-humidity state helps with that a lot! Last edited by Jmason; 06-20-2017 at 05:09 PM. I picked up a Shoei RF1200 a few weeks ago. New bike, new helmet. It has good venting, light, decent wind noise, quiet. Pleased with my new GT Air. quexpress and aemacleod like this.